Simple Amps has its own cabinet shop. 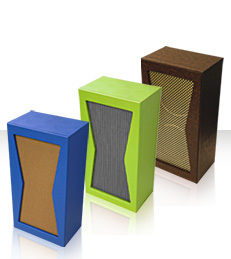 With the attention to detail, Simple Amps has taken a unique approach to speaker baffle design. This design joins the speakers together. The metal speaker baffle transmits the sound to the cabinet in a new way, allowing the open back cabinets to have a solid bass response without compromising mids and highs. Click the below PDF icon for more information. © Simple Amps logo is a registered trademarks of Simple Amps. All other trademarks are trademarks of their respective owners. Product specifications are subject to change.